I received an ARC of 'Janet and the Bear' from the author, in exchange for an honest review. 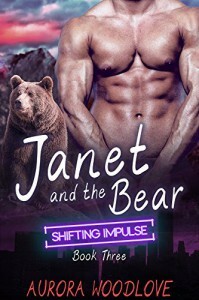 'Janet & the Bear' is Aurora's third book in her series "Shifting Impulse"... once again the description had me intrigued & couldn't wait to start reading. Once again I quickly found myself lost within the storyline, Janet is Celine's best friend & a bartender at Shifting Impulse & finds herself working the night of Celine's birthday. It's also on that same night that Janet meets landscape & wildlife photographer Sean... I really wish this book was longer, I could have read so much more. I also love how this book was set to start on the same night as the first 2 books in the "Shifting Impulse" series, & I hope there is more to come.